Volume six does start of a bit differently that usually and we don't see much of the Dursleys, but Harry's soon back at Hogwarts with Ron and Hermione. Now they are all three 6th graders and they have finals and home work and lots of classes, but we also have to remember that Voldemort is back and that he and his Death Eaters are on the lam and killing people left and right. Security is tight at Hogswarts, but Harry suspects an inside job and is moonlighting as Malfroys shadow while taking extra lessons with Dumbledore. All in all Harry is very busy. Ron and Hermione is also busy, but they seem to be spending most of their time hurting each others feelings, while they try not to admit that they are fond of each other. Lots of talk about who snogged who first and when, and not enough listening to Harrys crazy suspicions about ... well, the usual suspects. The really meaty parts of this books are the extra lessons with Dumbledore, which mainly consists of trips back into other peoples memories. Most of the memories are about Voldemort and what makes him tick – what made him into the monster he is today. 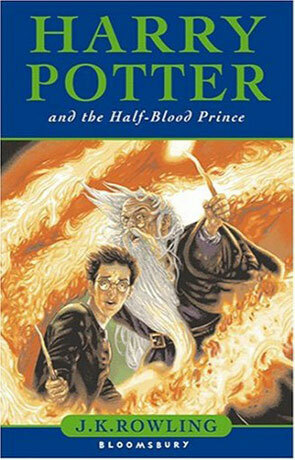 This books doesn't have must of a plot of it's own, there's no central mystery, with a clear cut and victorious finale for Harry, the book is simply one big info dump, getting us ready for the last volume. Not that it's boring in any way. Oh, no, we get a lot of interesting information and lot of character development, lots of small stories within the big story, one big fight and yes, one of the central characters dies! What we also get is a lot of references to the current War on Terror – This book is clearly a post 9/11 book. Now Rowlings morals are mostly harmless, but there was some surprising stuff that will probably make you pause, whether you agree with her or not. I was quite surprised that Dumbledore didn't object, to Harrys stated goal of killing as many Death Eaters as possible, especially since Dumbledore makes earlier makes it quite clear that killing is bad. The basic message of the book, that you should study your enemy, is sound advice though. But then again, one has to remember that this is fiction and that Voldemort is pure evil. He's not motivated by stupidity or religion or a need for revenge or greed or any other of the normal excuses people have for killing each other. He is simply evil. Which means that you can only take the parallels to the real world so far, unless you insist on a really simple good/bad black/white us/them way of looking at the world. All in all a quite entertaining book. I wouldn't have minded that it has had a bit of a plot of it's own, but as a part of the bigger story is has it's place and does it's job very well. One last small thing: I've started to read on my PDA (small hand held computer), as it's easier to carry around then books and the screens of these machines has become quite good, making them a joy to read on. But none of the Potter books are available in electronic form! You can't by an eBook version of any of the Potter books! This is probably done because somebody is afraid that people will just find a pirated copy and then not pay for it. Well, doh! Bazillions copies where pre-ordered of the book. Rowlings nor her publishers are not going to go to bed hungry time soon, but really the important thing is, that two days after the book came out, I found three different electronic versions on the eDonkey network. Two days. It took me twenty minutes to download them all (just in the interest of science – I did delete them as soon as I had verified they where the real deal). If people want an electronic version of a Potter book they will get it – by not selling it, you do not give people the option of paying. Written on 30th July 2005 by TC.